The Southwest North Dakota town of Killdeer can boast of two unique distinctions. First, each July they host North Dakota’s oldest PRCA rodeo. Secondly, the first roundabout on a North Dakota highway was recently completed in Killdeer, ND. Not only is this the first roundabout constructed on a North Dakota Highway, it is believed to be the 2nd largest roundabout ever constructed in the United States. The NDDOT selected a roundabout for this intersection because they believed it was the best option for handling the high traffic volumes resulting from the oil boom in the area. 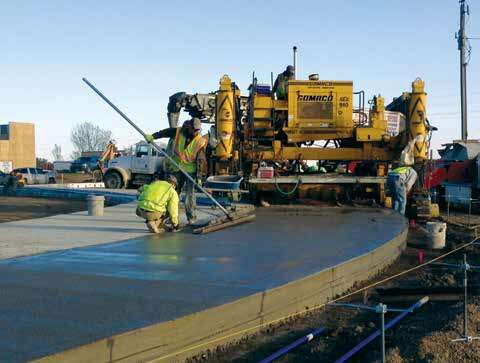 Traffic in Killdeer and the surrounding area has grown exponentially in recent years and it is anticipated traffic levels will continue to climb. In excess of 17,000 vehicles per day currently travel through this intersection. 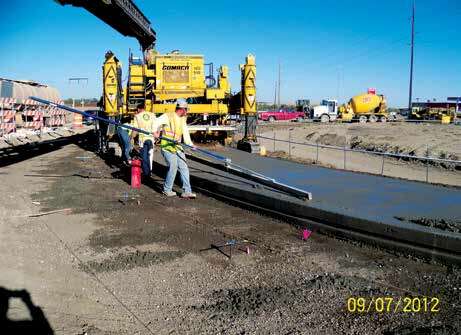 Because Hwy 22 is the only road into and out of Killdeer, it was critical that traffic be maintained all through construction. The NDDOT chose a roundabout configuration due to past experiences with success in other locations. It has been shown that roundabouts not only significantly reduce traffic delays, they also significantly improve intersection safety by reducing the number of accidents and eliminating perpendicular or T-bone crashes. 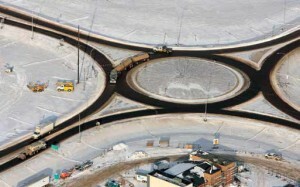 The NDDOT designed the 200 foot diameter roundabout with oversize trucks in mind. Designed to handle tractor-trailers 75’ in length with ease, it will also handle much larger and oversized trucks. It incorporates a 20 foot driving lane, but the designers also added a 10’ interior truck apron to allow for the rear axles of larger trucks and combination vehicles to negotiate the roundabout. The lanes carrying traffic into the roundabout are 16’ wide. 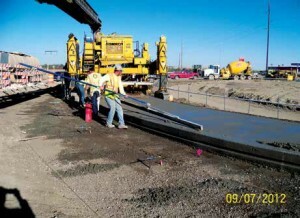 The $3.3 million project was constructed in three months, while maintaining heavy oilfield traffic through the intersection during the construction process. Construction was 7 days a week to meet construction deadlines. Through effective partnering on the project to address traffic congestion, a value engineering savings of $30,000 was achieved. This important change also enabled 70% of the concrete pavement to be slip-formed.